Montgomery Shade & Awning, Ltd. is a leading supplier of awning products for all types of commercial applications. 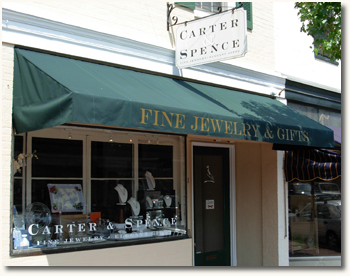 We specialize in the small "Main Street" storefront awnings and repair, maintain and recover antique roller awnings. Aluminum awnings with fabric stapled in place are available for more modern architecture. Our extensive commercial client list includes hotels, shopping centers, medical facilities and government locations. Visit our Commercial Portfolio for a sampling. In less traditional locations we can offer illuminated or backlit awnings and/or the most detailed and complex graphics to capture your customers' attention. We can provide digital photographic renderings of your location with the proposed awnings shown for your planning or for submission to HOA's or architectural review boards when approvals are necessary. Building permits are required for new commercial and institutional awnings and canopies, including engineering certification that the awning can withstand 90 mph winds and 30 pounds per square foot snowloads. We offer all awning fabric distributed in the United States and we have hundreds of samples from every manufacturer, whose warranties range from 5 to over 10 years. Visit www.awninginfo.com sponsored by our trade association for information on the different types available. Montgomery Shade and Awning warrants the installation, workmanship and manufacturing of all products offered. Montgomery Shade & Awning can provide a cost-effective solution to any business. Call or email us for a FREE on-site estimate.